It works best to be pruning blackberries in the spring of the year. It's also much easier to prune and pick the thorn less blackberries. There’s an advantage to pruning blackberries in the spring verses the fall. Extreme cold temperatures might kill some of your blackberry canes. When you prune blackberries in the spring, you can decide which blackberry canes you want to keep and which ones you want to prune. 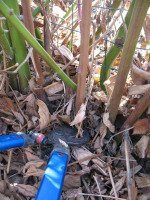 You’re going to prune out any canes that were damaged during the winter. 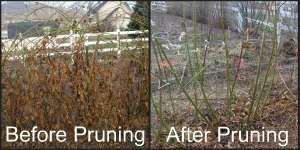 Prune your blackberry plants before they begin to leaf out. All the blackberry canes that produced fruit the previous year should be cut off at the roots. The old canes won’t produce fruit. The new growth is green and the old growth is brown. If you're not sure, check to see if there are any old berries on the plant. It's an old cane if it has old dried up berries on it. Select and keep three to four strong and healthy canes from each blackberry plant. You might need to thin out some of the new growth from last year so that the canes aren't too close to each other. Cut off the canes 4 feet high. 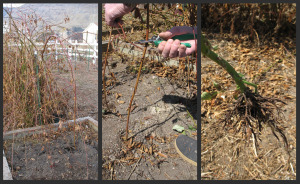 Now you’re going to prune the side branches that are coming off the main blackberry canes. Cut each side branch 12 inches long. These side branches will produce fruit this year. Fruit will also develop from each bud on the main blackberry cane. The canes should be spread out evenly and tied to a fence or trellis. The canes leaf out and grow vigorously during the summer. If the long canes get out of control you can give them a “haircut” or create new blackberry plants. If you’re going to cut the blackberries back during the summer, cut them 4 feet high. The new growth produces next year’s fruit so don’t cut the new growth too short. 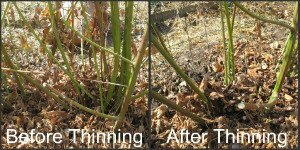 If you want more blackberry plants, plant the tip of the long cane in the dirt. It will grow roots and create a new plant. 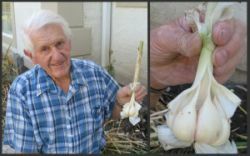 The following spring you can cut the new plants away from the mother plant, dig up the roots, and transplant the new plants.